Are you an engineering aspirant or currently pursuing an engineering degree? Do you feel any difficulties with your studies? We, IGNITE have the solution for all your learning needs. 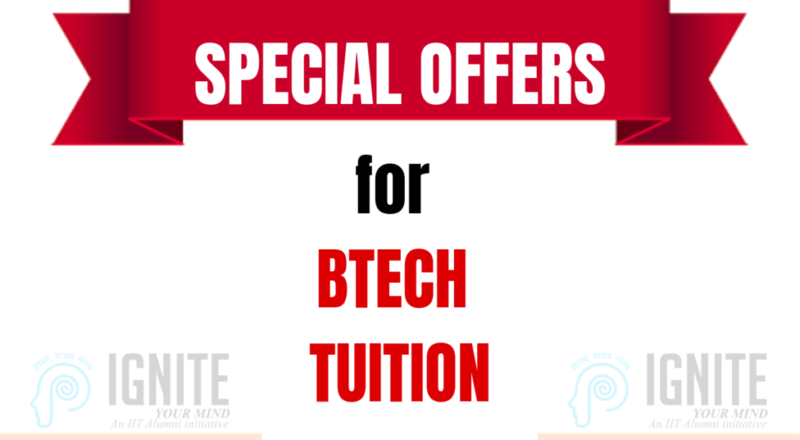 We are providing B.tech tuition for students pursuing an engineering degree from almost all universities with many offers. Group offer For a group of a minimum of 10 students at Rs. 1500 per subject for full modules. Education has become expensive and that much difficult to complete it successfully. Many students are paying for their degree by taking loans. And it takes months or years to pay off their student loans. So you have to work hard for achieving success and for making worth of what you have paid. You will have a clear idea of what engineers can do at their work, but you may think why this course is considered to be one of the more difficult disciplines. Hopefully, you will have a science background in your higher secondary education with physics, chemistry, and mathematics as the major subjects. Even then you may face difficulty in studying. From your school life itself, you can start your preparations. It will be better if you may take a couple of courses and online assessments. It will help you with spending your valuable time wisely, and also allows you to avoid the courses that you can’t handle well. Know your strength and make decisions considering those strengths. Your interest and strength may be different. So plan in advance in which stream you can excel well. Make a self-study plan and go through the way you have nicely. Make learning a daily routine and get a clear idea about what you have learned yet. Tuition classes will be a better idea if you can’t handle your studies alone. It will also help students to clear their doubts and will have more insight into the subject. Do you think that you need tuition? If yes, then contact us for getting more details about what we serve to our students. What do you get from us ? 1.Classes are available for all branches of engineering – We have faculties for providing classes for all major subjects. 2. 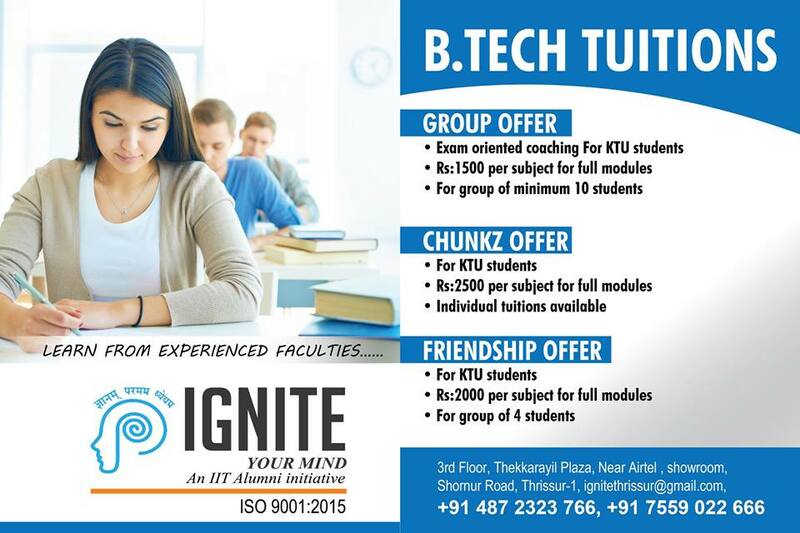 Syllabus of all major universities like KTU, Calicut, Anna, and Kerala are handled by our faculties – Our faculties are able to handle the syllabus of all major universities. And they have clear knowledge about the important modules in each subject of particular universities. 4. We have experienced faculties – Our faculties have experience of over many years and they are well versed in their respective subjects. 5. Individual attention is given for each student – We have a large slot of students, even then we are able to give individual attention to them for ensuring them with high scores in their exams. 6. Students are availed with continued assistance – Students are able to clear their doubts at any time and they can also make use of our services at any time even after completing their coaching for the specific exam they have enrolled. 7. Classes are taken on exam oriented basis – We make our students learn about the entire modules in each subject and give more focus for the important questions that are frequently repeated and our faculties always take the class on the basis of exam-oriented syllabus. Coaching for NATA exam – We are considered to be the provider of best NATA coaching in Thrissur. Higher secondary tuition – Tuition classes are available for higher secondary students. Technical PSC coaching – PSC coaching is gaining popularity among everyone with the importance of government jobs. Industrial extension officer coaching – IEO coaching is provided by experts. We wish every students success in their career. All the best for your exams. Contact us for knowing more about the offers we provide with the students joining our tuition classes.